One of the most popular leafing veggies to grow, spinach also lends itself to easy balcony or windowsill cultivation. Choose the right season, good soil and compost, and you will be better off eating the spinach you grow instead of the highly contaminated ones sold in Mumbai’s markets. SEASONS: Spinach is a seasonal plant. It will grow all year but shows a marked preference for winter – our hot suns in summer often making it dispirited and bitter (in leaf!). Ideally, plant in November for a winter crop, or in the cooler months of the monsoons. If you plan to grow it in the hotter seasons, then do so under a shade net. PROPAGATING: This plant is easily propagated from seed. GERMINATING: Spinach is best germinated directly in the ground, in soft soil prepared with a mixture of compost and cocopeat. Seeds can be shown in shallow, 1/4 inch deep holes or scattered on the surface with a sprinkling of soil above. Place in semi-shade and spray water evenly. Using a spray, and not a watering can is very important, as its seedlings are extremely delicate. Spray your sown seeds daily until seedlings emerge in 7-10 days. PLANTING OUT: Being so delicate at early growth, spinach does not take easily to transplanting. So it’s best to avoid it and nurture your seedlings in their original spot, growing them in rows or bunches for mutual support. You would also need to protect your needle-like saplings from birds and other pests who tend to squat on them and destroy them immediately. Your saplings can be exposed to stronger sunlight after 2 weeks of growth, or when they become sturdier in stem and longer in leaf. Ensure that the soil is slightly acidic, well-drained, and well-composted, as high nitrogen levels are perfect for this veggie. Spinach enjoys long hours of sunlight, but needs to be protected from the strong heat of Mumbai summers. Temperatures over 32 degrees Celsius will make your spinach grumpy, turn its leaves bitter and lead to early bolting (flowering). 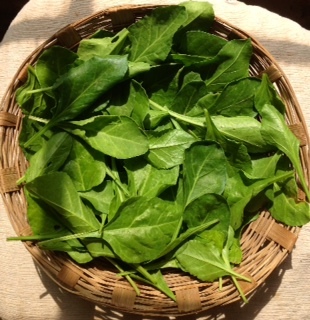 Spinach grows well in open plots and in small to medium containers. NURTURING: Water deeply each day, twice a day in summer. Harvest spinach leaves regularly to prevent bunching, water humidity in foliage, and consequent proneness to mildew and fungus. Grow marigold, basil and garlic between your spinach plants to deter leaf-eating insects and worms. If a plant gets infected, uproot and destroy it immediately as the disease/leaf-eaters will spread quickly. HARVESTING: Your plants will produce for the entire season (3 to 4 months). Harvest spinach for its leaves at any stage, by snipping off bunches of grown leaves regularly to allow space for more growth. You can also harvest spinach for its seeds by collecting flower heads of mature spinach plants, threshing for seeds, drying thoroughly and storing in a cool, dark place. When leaf productivity declines in peak summer, uproot, compost, replenish your soil, and use that space for growing fruiting or rooting veggies next. 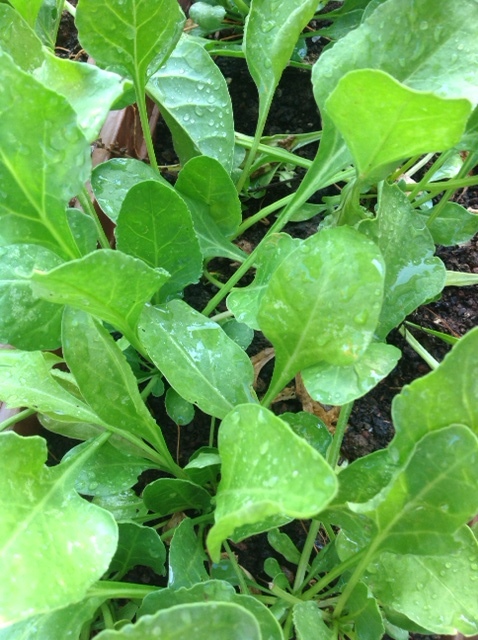 Hi there, spinach seedlings are very fragile and so it tends to do well when planted close together, in bunches, in well-composted, soft and friable soil. Because of their fragility they tend to get knocked down by strong winds, watering, birds etc. so try and shelter them and water with a gentle spray until they grow taller and stronger. Good luck!